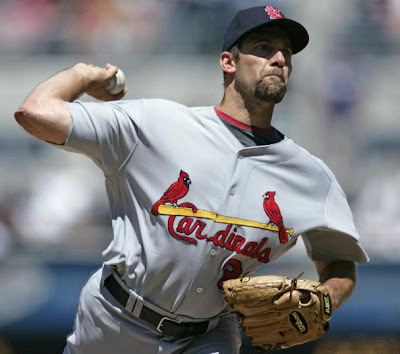 An Opinion On Sports: John Smoltz: This Cardinal is Flying High! When John Smoltz was with the Boston Red Sox just a short couple of weeks ago, his record was 2-5 with a bulging 8.32 ERA. He bore no resemblance to his old self. It seemed that Father Time had finally reeked havoc on his golden right arm. Smoltz himself obviously never bought in to such career ending jibber-jabber (that term is straight out of Boston Legal!). Now fast forward to yesterday where John Smoltz of the St. Louis Cardinals fanned a season high nine San Diego Padres, while issuing no walks over five scoreless innings. Granted, the Padres do sport the second lowest batting average in the majors with a measly .240. Nevertheless it is still the 'Bigs', and for Smoltz to bounce back like he did against even them is pretty heavy stuff. The dude is 42 years old and Father Time will come a knockin' at some point. Just not quite yet.